Rated 4.6 out of 5 stars.1722 total votes. Stylist's Tip: A stylish writing desk makes the perfect foundation for an inviting (and productive) workspace. Top this classic design with an acrylic organizer to keep all your necessities at the ready, then add a bright bouquet for a cheery finishing touch. Height from the floor to the drawer: 24.5"
Buy the Pinkerton Writing Desk online now for the perfect mix of style and savings. Whether you just want to buy the Pinkerton Writing Desk or shop for your entire home, Joss & Main has the perfect piece at the perfect price. Love my new desk! Beautiful! Gorgeous desk with great detail in the design of the legs. Not too small, not too big. Just what I was looking for! Absolutely perfect, color true to images. Small yet functional for makeup/ office room. It took me less than 20 mins to put it together, all you have to do is screw on the legs with the provided key and Voila! I changed the knobs for a better aesthetic and design flow with my other decor. Fast shipping without a scratch! Can't beat the price. Great little desk! Easy to put together and was packaged so well, I received it blemish free. Beautiful bluegray color is as depicted online. Cute desk. It came slightly damaged which is why I gave it four stars. Way fair credited my card and I reordered another. I decided to order a white one because I thought it would look better with my paint color. Love the look! It has simple lines. I agree with others that it could be used as a side/sofa table. I'd give the white desk five stars! This desk is a beautiful shade of yellow. It's the perfect size for my writing room and it's very sturdy and well made. Im purchasing fun knobs to add to the quirkiness of my room! Perfect purchase! I just needed a desk that wasn't too expensive but didn't look cheap, so this fits the bill. It's actually wood, so it's a good value for the price. Assembly was really quick and easy. My main qualm is that the front of the drawer could be a little bigger, since there's slight gapping around the edges. But for the price, it's not a deal breaker. A chair with a 20in or so seat height would work, too. Would recommend. Rated 4 out of 5 stars.407 total votes. With its clean lines and compact frame, this classic writing desk is ideal for anchoring a small study or for adding an impromptu work space to the corner of your living room. Made from a mix of manufactured wood, solid wood, and veneers, this piece measures just 30'' H x 40'' W x 23'' D overall to ensure it won’t take up too much square footage. One drawer lets you tuck away your keyboard or stash a few supplies, while a neutral finish gives this design the versatility to blend with any color palette. Rated 4 out of 5 stars.326 total votes. Anchor your office or study ensemble with this essential desk, perfect for everything from DIY craft projects to penning letters. Rated 4 out of 5 stars.535 total votes. Whether used to work on homework or draft a college admissions essay, this understated desk is a must-have for your teen’s study station ensemble. Crafted from manufactured wood, it strikes a clean-lined silhouette and boasts a solid neutral finish for a look that won’t easily clash with your current color palette. Plus, it includes one drawer on a soft-close wood slide for keeping writing tools, important papers, and more! Measures 30'' H x 38'' W x 23'' D.
Rated 4 out of 5 stars.268 total votes. A desk is a central point for any work space, and the right kind of a desk can make a huge difference in terms of comfort and work ability. 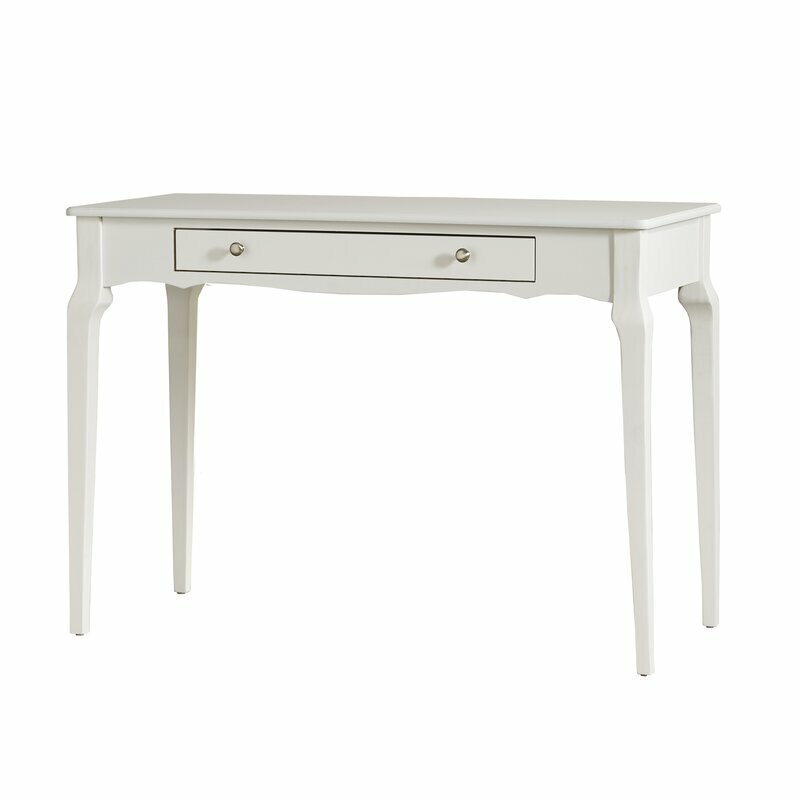 A desk like this offers every room a touch of traditional country charm for a work surface. 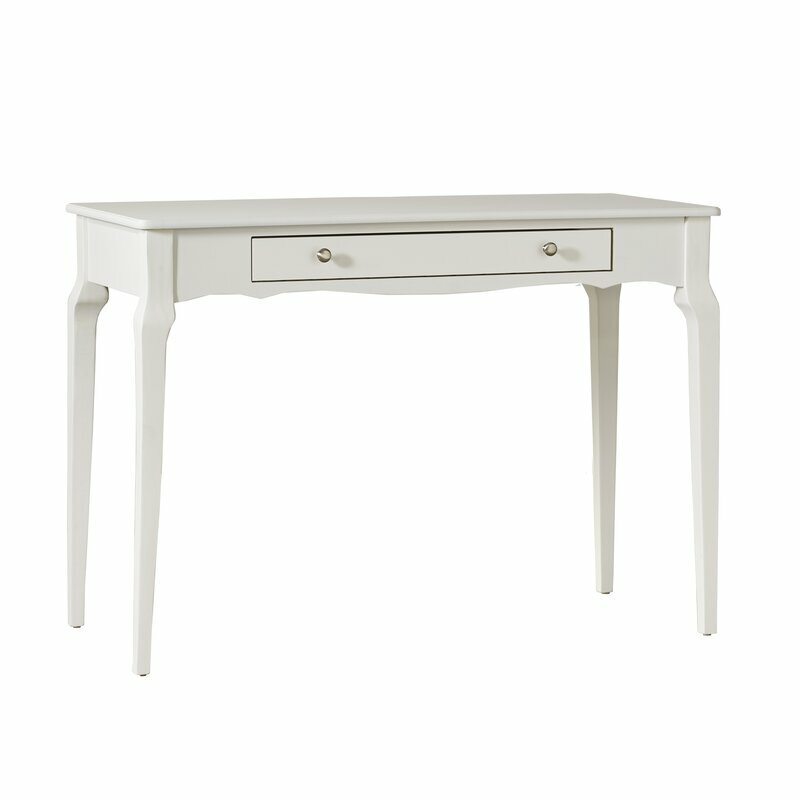 Featuring cabriole legs and a scalloped base, it showcases a silhouette with tons of classic appeal. But don't compromise on function for aesthetics: this desk also features a single drawer that measures 3.625'' H x 10.625'' W x 14.75'' D, perfect for storing your work essentials. Rated 4 out of 5 stars.351 total votes. You don't need a home office to get work done! Craft a creation station in any space throughout your abode with this must-have desk. Taking on a clean-lined silhouette that blends contemporary styles with what's classic, this piece is constructed of manufactured wood and birch veneer. While its versatile brown finish may seem simplistic, it gets a dash of distinction thanks to slatted side panels and a drop down drawer adorned with two polished knobs. Simply set this design in the living room, master suite, or any other quiet area, plop your laptop in the center, and pull up a side chair so you can start typing away. Rated 4 out of 5 stars.128 total votes. Sleek and modern, this writing desk will have you completing your checking off your weekly to-do list in style. The tabletop is crafted from high-grade manufactured wood with a glossy painted finish, while metal hairpin legs, awash in chrome, complete the look with a nod to mid-century design. A pair of drawers, each set on metal ball bearing glides, help cut clutter, and an open center compartment, featuring a cable management opening, offers additional space to charge phones, hook up electronics, and more. Rated 4 out of 5 stars.1386 total votes. Looking to round out an unused corner of your teen's bedroom or dorm room with a handy study space? A corner desk like this is a space-conscious option for adding a work space to your home. Crafted from a blend of pine and manufactured wood, this 30'' H x 42'' W x 28'' D piece features an understated design perfect for a variety of home aesthetics. A single soft-close drawer and lower shelf round this piece out with handy storage space for office essentials. Rated 4 out of 5 stars.176 total votes. Add a contemporary touch to your office or home with this desk. Compact in design, it is ideal for small homes.The desk offers a generous extended work surface. A pullout drawer gives you room to store your writing accessories. A great way to maximize space of any room, ideal for writing, using your laptop, studying or handcrafting. Rated 4 out of 5 stars.656 total votes. Display a collection of your favorite objects or antique atlases on this essential desk, a handsome addition to the library or study. Rated 4 out of 5 stars.115 total votes. Ideal for a chic home office, bedroom, or living room, this writing desk makes a perfect spot to work from home or scrawl out some correspondence. Crafted from manufactured wood with laminated veneers, it showcases four splayed, mid-century inspired legs and a box-shaped desktop, all in a neutral hue sure to blend in with a variety of color schemes. Two drawers help you to stash your spare office supplies and stationary.